Crown gall is a bacterial disease of the stems and roots of many woody and herbaceous plants, including fruit, vegetables and ornamental plants. Infection with this disease causes knobbly swellings (galls) on stems, roots, trunks and branches. Crown gall is a disease caused by the bacterium Agrobacterium tumefaciens (synonym Rhizobium radiobacter), which enters the plant through wounds in roots or stems and stimulates the plant tissues to grow in a disorganised way, producing swollen galls. Galls are present all year. Note: swellings caused by crown gall should not be confused with the harmless nitrogen-fixing nodules produced on the roots of many members of the pea family. If crown gall is detected, lift and destroy affected plants. 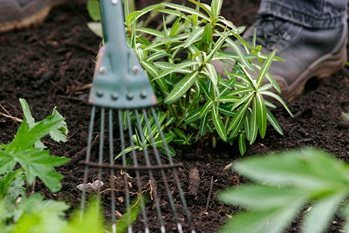 Grow crops of potatoes or other vegetables (except beetroot, which are also susceptible) over the next one or two years to help eliminate the bacteria from the soil, or grass the area over for one or more years. There are no chemicals available for the control of crown gall. The crown gall pathogen Agrobacterium tumefaciens inhabits the soil where it can survive for long periods. Not all strains of this bacterium are pathogenic (capable of causing disease) and there are several different pathogenic strains with differing host ranges. The bacteria enter stems or roots through wounds. The bacterial DNA combines with the DNA of the plant host cell where it ‘transforms’ the cell, causing it to become tumour-forming (galls) and also to produce specific new materials on which the bacteria feed. As the gall grows, the plant tissues become disorganised and normal transport processes are disrupted. In herbaceous plants, the gall rots and the bacterial cells return to the soil. On woody plants, the galls are woody and perennial and do not rot away.